Heh heh heh... that's a great PSA, Cody! Yeah, I say that to the woman all the time! even after that link I shared with you yesterday? I hope so!!! xoxoxo Love you too! 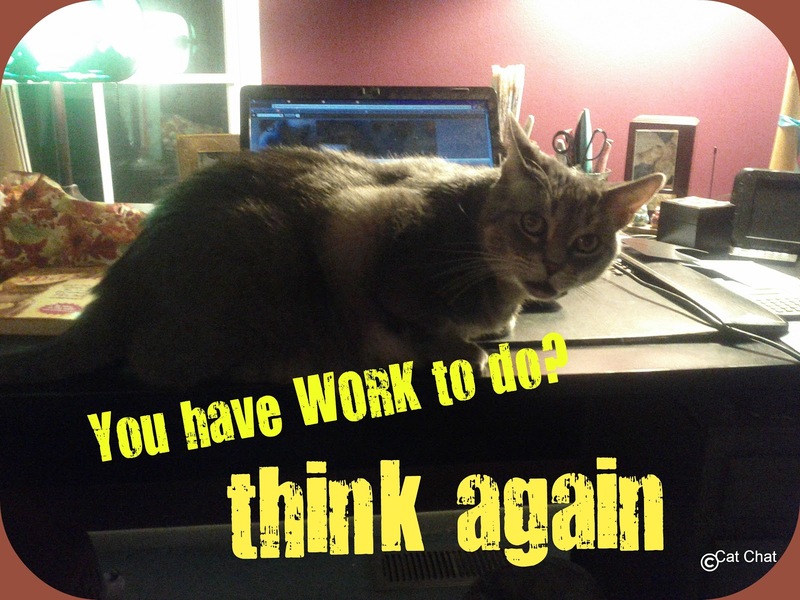 MOL, that'll teach you to try to get anything done! EXACTLY!! I'm laughing at some of the interpretations that were different than what I had intended. You got it! Helping me run my blog IS work! I make sure my human always remembers that. Ha ha! Have a terrific Thursday. thank you Molly! You too! Blogging IS your work! MOL. She truly did love it, she laughed out loud and decided that she wasn't gonna write anything for today. It worked!!! Ya got that right Cody! You're so right, Cody! Mom should make a pause and THINK AGAIN!!! Oh Cody, that is such a good idea. Give Mom a day off. She needs that. Hope all of you have a great day. Cody we know how you feel we are waiting for Mum and she's skiving - as usual! yeah, what's wrong with these people!!?? "flings you on to your heating pad" I'm dyin here! I'm with you Cody. What's with the humans sitting in front of the puter thing all the time - claiming it's work. Oh sure!!!! I think he needs a job of his own. Do you paper? The things you don't need you could ball up and have Cody put them in the round file. Of course he may have to take them out to re-check and they may end up ALL OVER your floor! But really , give hin an Assistant title too! You tell her! Love the annoyed look on your face. Whoa Cody! You really can give "the look"! LOL! Cody, you are doing a most excellent job in stopping a human work activity in its tracks. No work has priority unless it somehow revolves around us. I've perfected that look myself. Well, Cody, at least YOUR Mom is home with you. Mine deserts me for like elebenty hours every day! It's Just Not Right. Uh, we think your mom's work is keeping you happy! Sometimes they do forget to ask permission don't they!! Bah, work always gets in the way!